In the internet and electronic banking age, laundering money can be done online through legitimate websites like eBay. 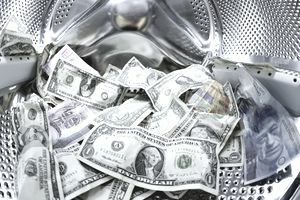 There are common scams on eBay that suggest laundering money, but let's take a look at how money laundering works, exactly what it is, and why it exists. "The process of creating the appearance that large amounts of money obtained from serious crimes, such as drug trafficking or terrorist activity, originated from a legitimate source." A traditional money laundering scheme works like this. Let's say Jim and Nathan are involved in selling illegal drugs and have a huge cash flow coming in. It is dangerous and foolish to keep cash lying around, so they need a way to get the cash into a bank without looking suspicious. The banking industry is required by the government to report any cash deposits to the IRS. The bank can also report any suspicious cash deposits, such as frequent large amounts of cash or customers keeping large amounts of cash in a safe deposit box. These IRS reports exist so that illegal operations can be detected, and to ensure that businesses are paying taxes. So people running illegal operations need a way to get the money into the bank, where is it safe, without tipping off the bank. Any large amount of cash or frequent large cash deposits are usually not obtained legally. Jim and Nathan open a legitimate business where cash routinely flows in such as a restaurant, nail salon, car wash, ice cream shop, coffee shop, or gas station. These businesses are called a "front" for money laundering. So when Jim and Nathan submit cash deposits to the bank every day from their legitimate businesses, they add a little extra cash from their drug sales to the deposit bag, and their dirty money from drugs gets mixed in with the "clean" money from the legitimate restaurant or nail salon. This is where the term money laundering comes from. Little by little, the dirty money makes its way to the bank mixed in with money from the other businesses. So the dirty money appears to be clean. Under these rules, some sellers are exempt from receiving a tax document from the government. (eBay sellers should report all income from their business regardless of if this form is received or not.) So some sales on eBay can stay under the radar, so to speak. Let's say Jim has a customer who wants to buy something illegal, such as drugs, stolen property, or weapons. Rather than create a transaction with cash, Jim tells his customer he will set up a listing on eBay for a particular item at a very inflated price. He will then send a link to the item to the client. This is called a "prearranged sale." No one will actually buy the grossly overpriced item, and Jim's client will purchase it, sending the money through Paypal. Also, eBay gets its fees and Paypal gets its fee of 3 percent. Jim ships a box of rocks or some insignificant item to the client's address and no one is the wiser. Once the transaction has taken place on eBay, and the money is in Jim's account, he meets up with his client to deliver the actual goods which again may be drugs, weapons, or some sort of contraband. The transaction takes place, the money has changed hands, the illegal goods are delivered, and all of this is done under the radar. Millions of items are sold on eBay every week, and some legitimately sell for hundreds or thousands of dollars. So it is rather easy to blend into the crowd and successfully pull off illegal schemes on the world's largest online marketplace. The adage "if it looks too good to be true it probably is" holds true here. If you are searching completed listings and see something that doesn't look right, it probably isn't. Do further research, such as learning more about the seller and the item being sold, and look at the law of averages. There could be much more to the story than you are seeing on your computer screen.